Want to have a glimpse into the nightmare world of IT staff? Just close your eyes and picture wires. Lots of wires. This discomforting image is just one part of an ongoing horrific tragedy: IT staff and office workers in general are faced with an array of business applications and technologies that seemingly only become more numerous and complicated with the release of each new model or update. What may appear to be a bundle of wires or overabundance of software features can quickly become a detriment to any business, and can leave your technologically savvy co-workers pulling out their hair and quitting their jobs. Current forecasts regarding what the office of tomorrow is going to look like does little to diminish this overbearing complexity- omnichannel communication plans, AI driven contact centers, and the ongoing need to drive business via social media are all major contributors to a clutter problem that has been rotting away at promising enterprises for decades. In recent years, Algo Communication Products Ltd. has experienced many of these problems vicariously through our clients, and have heard on multiple occasions the complaints of staff members who believe that the tools that they use in their personal lives are exponentially better than those they use at work. These observations have been hammered home by a number of studies performed by Avaya, the results of which indicate that many employees feel that the ease and flexibility with which they utilize their personal devices dwarfs any of the technological interactions that they have while on the job. 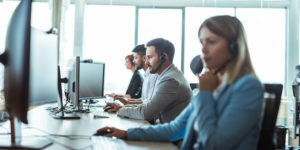 Enhanced Connectivity: Rather than tediously dialing extensions and numbers, calls or video conference chats can be created using voice commands only. The smooth interface here will ensure that participants feel connected in real-time, and need not worry about pesky dropped calls or interference. Personalization: Make your staff feel at home. The desktop features here are highly customizable, and users will be able to use their device to play music, show the weather forecast, answer questions, and basically use the Web in any capacity. Multi-Device Solutions: Different pieces of hardware will be able to integrate and connect seamlessly with one another. All users will be able to take advantage of the same premium services and features. One-Touch Service: Connecting with business contacts or accessing your favourite applications can be one touch away. The customizable component of the Avaya Desktop Experience can allow you to keep your priorities in line by maximizing their accessibility. Nothing is worse than seeing your staff slowly becoming more and more frustrated by the sheer complexity of the software and hardware applications within your office. By integrating Avaya’s new desktop devices your office will not only be able to move away from this unnecessary stress, but will also have access to some of the most powerful communication apps and devices that are currently on the market. With offices getting more convoluted there is no reason why you shouldn’t be making moves to oust the competition. Contact Algo today and we can work towards making your IT staff happy to face a new day on the job!